Southbank is a beautiful riverside stretch at the heart of central London, following the Thames from Lambeth to Blackfriars bridges. In walking distance to Covent Garden and Westminster its the perfect location for a relaxing stroll. The packed programme of theatre, exhibitions, music, film and free events means South Bank is an inspiring place to explore for all ages. This is the area below the London Eye, here you will see lots of street entertainers. In it's mission to achieve a creative and prosperous film culture and industry bas, the BFI drives creative, economic, and cultural success through a linked portfolio of activities. Under The Royal Festival Hall you will find a skate and bike park. Under Waterloo bridge you will find a book fair. There are also a lot of free events especially in the summer. Behind The Nation Theatre you will find the Haywood Gallery (please note this is not free to enter). 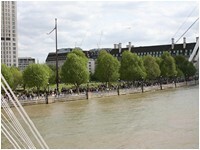 There is now a short walkway with lots of seats and views across the Thames, at night this are is lite up. There are is also used for shops during various festivals thought the year. Here you will find lots of bars and restaurants, there is also a bike shop where you can hire a bike to cycle along the Southbank. This park is always used for the festivals held on the Southbank. The old OXO houses many arts and craft shops and workshops. Be sure to visit the upper shops and workshops. There is a great florist in this building with some really unusually plants. Tip if you go up to the top of the OXO tower you will find a public viewing area. There is also a great restaurant, bar and bistro on the top floor. The Tate modern used to be an old power station and holds some great expeditions. There are some great cafe's in the building with fantastic views over London. In the summer you will find lots of out door events happening in the forecourt. This bridge is know as the Wobbly bridge, cross over this bridge to St Paul's. Blackfriars Bridge is the busiest of the four bridges in the City carrying over 50,000 vehicles a day. The current bridge was designed by Joseph Cubitt and opened by Queen Victoria in 1869. It has five wrought iron arches and a total length of 281m. There is no weight limit on the bridge.